The high performance luminaire is designed for applications where long life, low maintenance, and consistent color rendering are required. Areas with limited accessibility due to fixture location or where heavy traffic makes maintenance difficult are ideal applications such as parking garages, canopy lighting or low bay applications. The traditional design style of the luminaire allows it to be seemlessly integrated into existing systems when necessary. The heavy duty housing is constructed of die cast aluminum. The optical assemblies are sealed in place using a silicone gasket for weather tight protection. Each individual LED head can be rotated and locked in 15° increments.The low prifile housing is under 4” tall. The fixture is provided with a 4’ of SO cord with a watertight fitter at the fixture housing. ETL listed for wet locations (IP64). Additional IP66 rating available upon request. Made with a state of the art UV stabilized acrylic high performance refractive optical assemblies that use high transmicity materials to achieve precise photometric distributions. 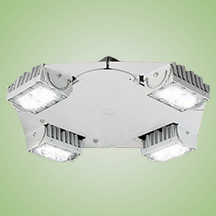 Individual rotating heads are available with Type III and Type V Wide beam configuration. A variety of shielding options are available to customize the light distribution for applications such as ramps or to reduce light pollution from escaping the lighted area. Available in a high output 4 or 8 LED system in 5000K Cool White (+/- 500K) or 4100K Neutral White color temperatures propagated with Philips Lumileds LUXEON® M LED’s. Available with 90- 300V 50/60 Hz Class II power supply. LED’s rated over 1,478,000 hours (TM21 Calculated L70) at 25°C ambient temperature at 1400mA operation. Lumen Maintenance >99% at 60K hrs. Optional 0-10V dimming. Built-in surge protection up to 10 kV. Built-in Active PFC Function >95%/Full load. LED Power Supply conforms to UL1310 Class 2 and UL8750 standards and is IP67 rated for wet locations. The fixture may be mounted on a 1/2” pendant (ordered separately). Contact factory for surface mount applications.